The Trustees launched the Dream of the People of Prestonpans [LINKED HERE] in September 2006, setting out a range of issues they would focus on. These Issues are listed immediately below here and a link is provided to the original documentation. As the Campaign has progressed significant steps have been taken giving rise to Reports and Plans and these are also summarised and linked below e.g. RGA's Economic Feasibility Study & haleysharpedesign Interior Visions. Follow the links given at HERE below for all the details. The Campaign was launched with The Dream and a detailed a Manifesto following extensive local consultations and an RSA CoffeeHouse Challenge in 2006. By December 2010 the Trust launched its PROSPECTUS to the Nation seeking £5 million to develop a Living History Centre at Prestongrange Museum . The Petition to the Scottish Parliament @ Holyrood to support the Campaign made as the Tapestry was being displayed in the MSPs Lobby with the PROSPECTUS also forwarded to them all by Iain Gray MSP; and as Historic Scotland launched its Consultation on Stage 1 of its establishment of a National Inventory of Scottish Battlefields - December 2011. Specifically £5m towards the total of £7m is sought from government and public agencies and the Trust commits to seeking the balancing £2m from private donors. Trust NewsLetters are printed from time to time for handing out at events in addition to the services provided for all here on this website; and NewsNet items posted regularly at this website - see News Reports button on left here. 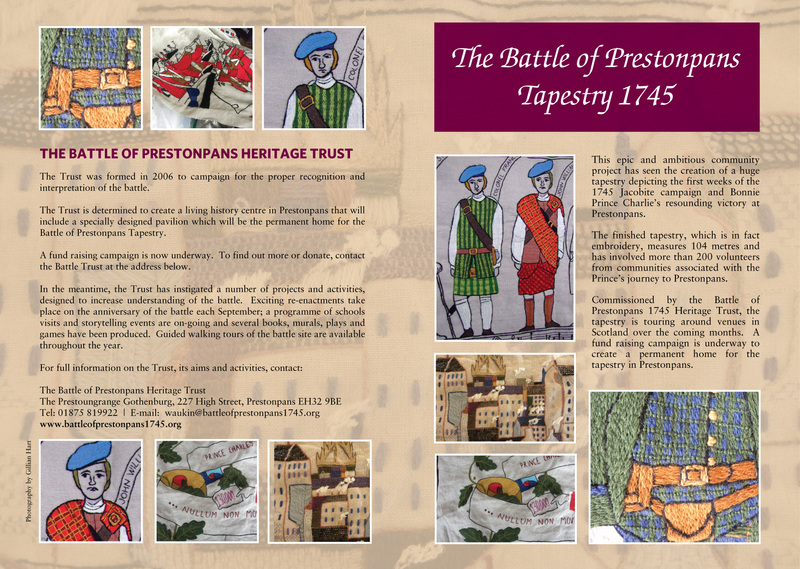 Source Tourism Solutions has undertaken exploratory studies with the travel trade and amongst societies & clubs to evaluate demand for visits and to develop ways to encourage visitors to enjoy a Prestonpans Experience of the battlefield and the murals art. These studies concluded that potential certainly exists and outlines ways to proceed which will continue to grow visitor numbers, identifying the Battle as the town's most alluring tourism attraction for trade suppliers. 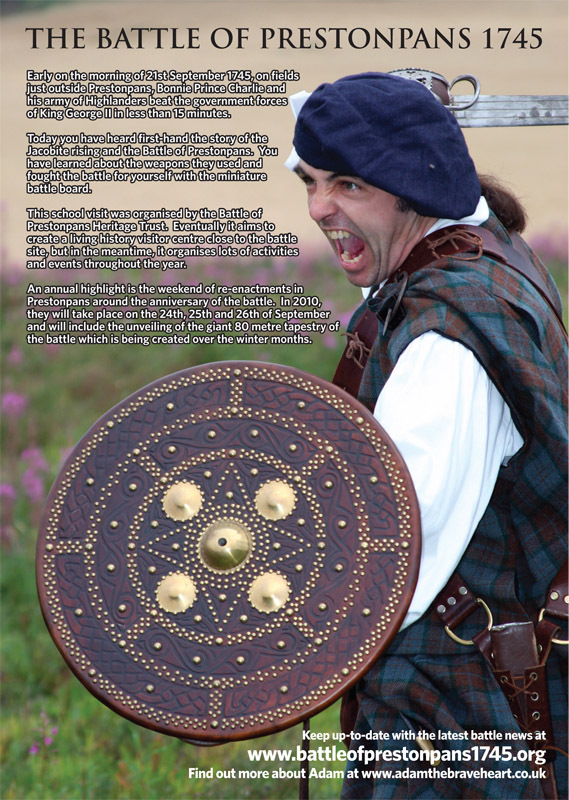 Ian Nimmo, PastChairman of the RLS Society, has written this 'factitious' history of Al[l]an Breck Stewart, whose name has been given to the re-enactment Prestonpans Volunteers established under Martin Margulies as Colonel-in-Chief in September 2007. Lessons have been learned each year and images captured. The first major external study commissioned by the Trustees explored whether or not a Visitor Centre at Meadowmill could, once capital expenditure had been met, function of a self-sustaining basis. RGA's Max Gaunt, a Tourism Potential Assessor with the strongest reputation in Scotland who correctly forecast visitor success for the Falkirk Wheel and the Scottish Parliament, was invited to undertake the evaluation for the Trust and we are delighted to report he confirmed the Trustee's intuition suggesting that some 70,000 visitors each year could be predicted provided the Centre was of the right quality. In 2010 the Trust resolved to explore the economic feasibility of locating at the Prestongrange Heritage Museum, and RGA updated their earlier study. They concluded some 120,000 visitors could be expected if the Museum's other facilities were substantially upgraded and interpreted. The Trustees absolutely believe that the necessary 'quality' Visitor Centre at Meadowmill must be based on thoroughly researched foundations, not least of the battlefield itself. And although the passage of 263 years has meant a considerable portion of that ground is now in residential and industrial use implying much may have been lost, it remains a primary requirement that what remains shall be carefully evaluated, archived and as appropriate prepared for presentation at the Centre. To carry this forward with the counsel of Dr Tony Pollard of Glasgow University Battlefield Archaeology Centre and the County Archaeologist Biddy Simpson, a 'Your Heritage' Grant from the Heritage Lottery was sought and gained in March 2008. Some £50,000 for HLF together with £10,000 from other Trust donors is being invested in this and other activities described below. The 'Your Heritage' Project also includes a September 2008 Symposium convened by Trustee Herbert Coutts for all stakeholders to debate Campaign Progress to date and future Challenges, the training of Visitor Guides and the creation of battlefield markers. The Visitor Centre is not to be a 'museum' of history. It is conceived as a forum for Living History, building on the Hope and Ambition created by Victory at Prestonpans in 1745. Whilst the story will of course be told of the stunning Victory achieved by Prince Charles Edward's Highlanders over the redcoat army led by General Sir John Cope, it will be the occasion for the celebration of the Hopes and Ambitions of each and every visitor that hears and sees it retold. To begin to imagine and to envision how this can be accomplished and sustained at the Centre the Trustees commissioned the internationally acclaimed interior design team at haleysharpedesign to work during the summer of 2008 and to present their own emergent ideas to MSPs at Holyrood Parliament and to the HLF sponsored Biennial Battle Symposium in Prestonpanson September 18th/ 19th. The Final Report was tabled in October and is linked below along with the two interim documents. During the early summer of 2008 Historic Scotland sought the nation's views through a Consultation Document setting out what they felt should be done to protect Scotland's Battlefields. The Trust considered the document not only amongst themselves but at an Open Consultation in Prestonpans on June 23rd to which they invited leaders from East Lothian Antiquarians, Dunbar and Prestonpans Community Councils, Prestonpans Historical Society, Old Musselburgh Club's Pinkie Group and the public at large. The overwhelming opinion was that the document was 'slight' and came nowhere near to meeting the requirements of the challenges or the opportuinities. A set of 'trenchant' comments were tabled and submitted to Historic Scotland as well as forwaded to the First Minister and the Minister of Culture. In essence the Trust argued that battlefields are far more than tactics and terrain. They have a vital educational message to share and they are an integral element in the personality and self esteem of the community where the battle took place. Simply to identify archaeologically the precise site and 'protect' it falls well short of what is required and international comparisons demonstrate this clearly. The Trustees were disappointed that the views they advanced were not accepted by the Minister on the advice of Historic Scotland [HS]. In particular the Trust had argued that each local 'stewardship' community should prepare a strategic proposal for their battle's 'interpretation, even though funding availability would clearly mean implementation could only be achieved over a long timescale. The WaggonWay that runs from Tranent to Cockenzie is arguably Britain's oldest railway. Its gravity system allowed coal from Tranent to reach Cockenzie Harbour with ease from the beginning of the 18th century - initially with wooden rails later replaced by iron. The proposed scheme will involve research archaeology, interpretation boards, the construction of a replica waggon and the re-routing of the surviving paths to join with the John Muir Way at the north. Bonnie Prince Charlie's Highland Army charged across the WaggonWay as they pursued the redcoats to the walls of Preston House in 1745. The Battle Trust is a Members of the Council of SCVO and when Raymond Duncan saw Andrew Dallmeyer's Battle of Pots 'n Pans at The Fringe in August he resolved to feature a supportive review of our work, commending our approach to other communities that are stewards of the nation's battlefields.Now there's a thought! The Trust with support from East Lothian Council's Homecoming Fund presented an Exhibition and a wide range of associated events hubbed from The Prestoungrange Gothenburg. The Briefing on the major Clans who were with The Prince at the battle on September 21st 1745 was prepared by Arran Johnston. The Minister of Culture Michael Russell MSP, with responsibility for Historic Scotland and the protection of Scottish battlefields, formally agreed with the Trustees at their meeting in April 2009 to assist the Trust in the next stage of its campaign to create the national living history centre focussed on the battle in 1745 - which is to develop comprehensive details and to seek funding. The 'next step' documentation was tabled with the the Minister's representatives from Historic Scotland on June 22nd. It was outplaced for a Concept Review by Devonhall Associates and the Trustees then responded to the opinions Devonhall expressed in November - as shown below.In July 2010 the Trustees summarised their emerging proposals as their PROSPECTUS FOR THE NATION [Edition I]. This explores Plan B i.e. that the Centre including a tapestry Pavilion should be at the Prestongrange Heritage Museum at Morrisons Haven. A comprehensive [Edition II] of the Prospectus was published in December 2010. Gordon Veitch has developed a BattleGame board 10' x 8' for thenTrust with scaled models of all the relevant buildings and topographical features on which the battle can be fought by gamers. 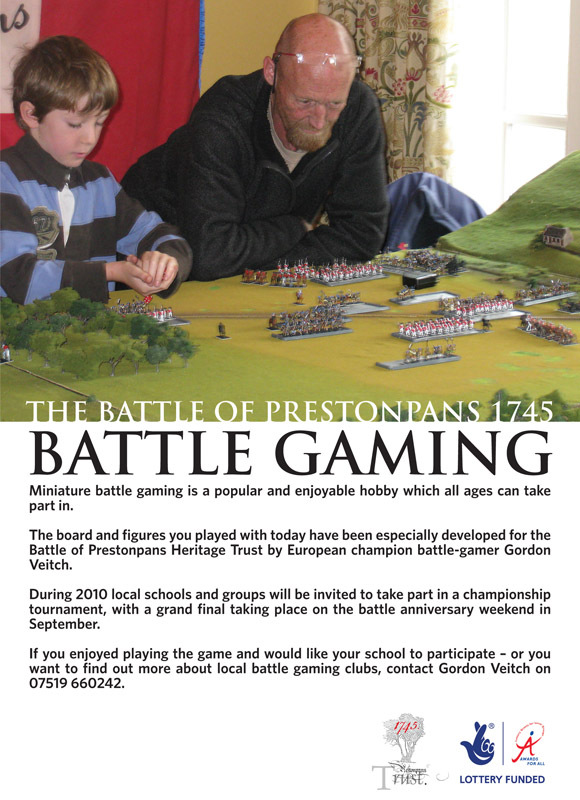 The ambition to visit schools to tell the story of the Battle of Prestonpans was realised with the support of the Scottish Arts Council in 2009/ 2010. Leadership and co-ordination for the Trust were by Kristine Cunningham and Martine Robertson. Greg Dawson-Allen was appointed as Story Teller and a comprhensive programme of visits to schools made using Weapons Demonstrations, the Trust's BattleBus, Gordon Veitch's BattleGame, the Adams DVD and a new Youngster's Guide especially written for the Trust by Stuart McHardy. In January 2010 the Trustees together with Prestonpans Community Council tabled a Petition to East Lothan Council that they should take better care of the area surrounding Cope's obelisk, the environment of the Battle Bing, road signage and realated issues; and that they should declare publicly their support for the Campaign. ELC Cabinet in June 2010decalred their supprt at the same toime indicating that they would wish to explore the possibility of creating the Battle Living History Centre at the Heritage Museum rather than on the Battle Bing. The Trust accepted that this proposition should be evaluated carefully - provided the battle site, battle bing and Riggonhead Defile were alo protected and presented effectively, and provided an overall plan for the Museum was put in place. If these provisos were acceptable then the Museum site had considerable advantages for the community at large. 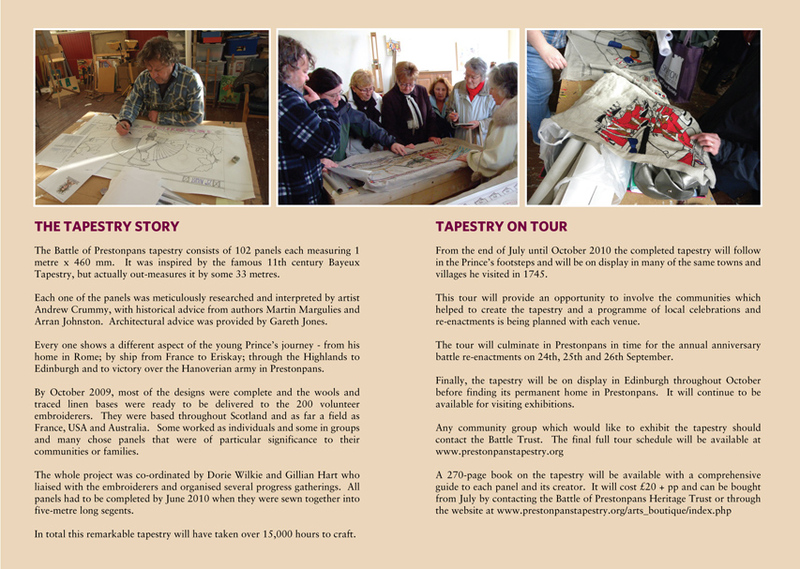 Throughout 2009 & 2010 the Trust and the Prestoungrange Arts Festival worked with 200+ embroiderers across the nation to create a tapestry 103 metres long x 460mm telling the story of Bonnie Prince Charlie's epic journey from Rome/ St Nazaire to Victory at Prestonpans in September 1745. 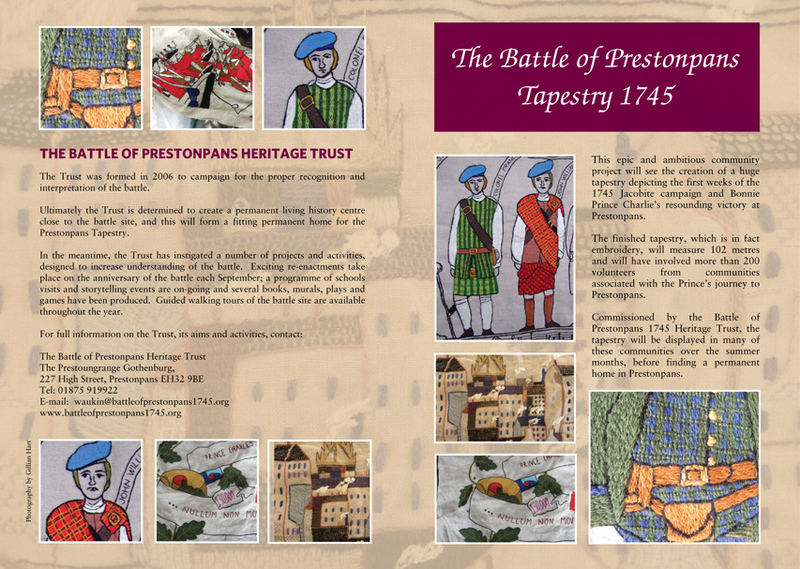 The full story of its creation is told at our dedicated website address www.prestonpanstapestry.org The design artwork was by Dr Andrew Crummy, Senior Stitcher was Dorie Wilkie with Gillian Hart as Convenor of the Stitchers.